2 years ago, Scott was in Guam for his birthday so I recorded the kids singing Happy Birthday to him. Juliana was the only one who could sing that year and the boys were contained so they couldn’t escape during the song. What a difference 2 years makes…they are all so much bigger now. 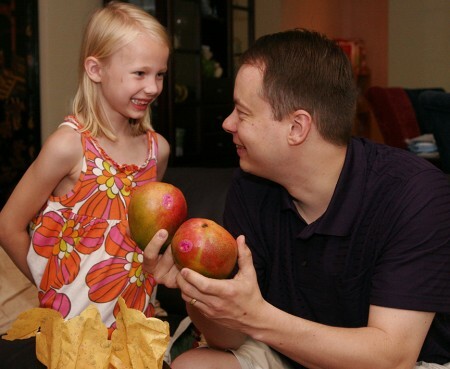 Juliana couldn’t wait to give Scott the birthday present that she selected for him – 2 mangos. She saw them in the grocery store and remembered that he really likes them; she was so excited! The first thing Wyatt said to me is “I want cake”, he is a big fan of birthdays. j gave such a great gift. way cool. hope your birthday was magnificent, scott!